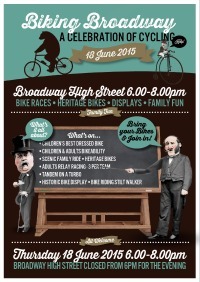 As part of National Bike week, we will holding a celebration of cycling in the evening of Thursday 18th June 2015 in Broadway. 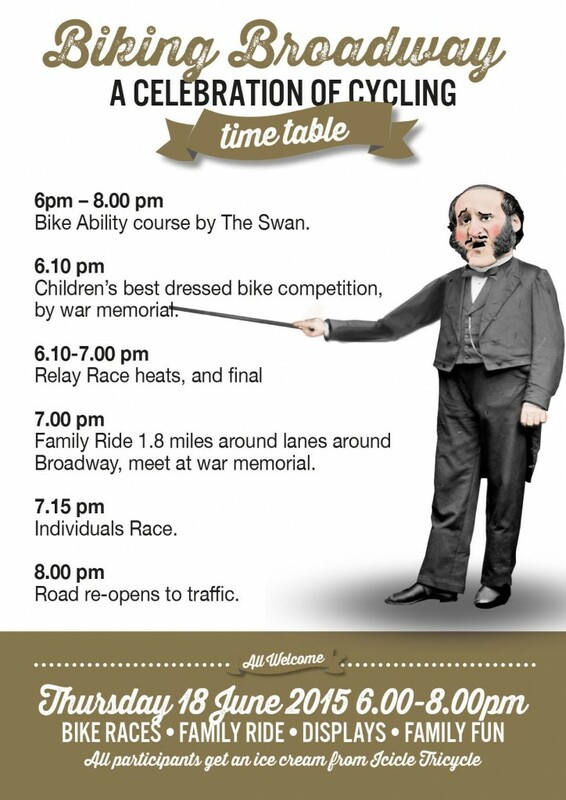 The High Street will be closed to traffic from 6pm to 8pm for various cycling related events and attractions. From the mini roundabout at the top to the Snowshill Road turn, there will be barriers and stewards. The main car public parks will be reachable and open for visitors as normal. A relay race consisting of Teams of 3 riders, sharing one bike Starting from the green, heads up to the Leamington Road mini roundabout and back down the High Street. or fill in this form for the fun relay race. *This is for fun, and the rules might change, be mis-applied, forgotten or stuck to as appropriate. Individual twice up and down the street for those who fancy a sterner test, top athletes on proper bikes welcome, as is anybody fancying a go. Probably a mile sprint in all with a sharp turn at the top and bottom. or fill in this form for the individuals race. Best dressed/decorated bike and rider competition. Under 12 year old entrants. Bring yourself and your bike dressed up however you want. Someone from TV, or a character in a book? A superhero, or an object. There are no limits. 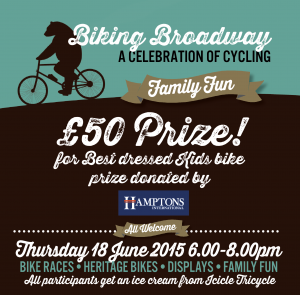 Hampton International have donated a £50 prize for the best dressed bike/rider. All participants will get a free ice-cream from Jo and Bo at Icicle Tricycle. Wychavon District Council and Cycle Evesham Vale’s BikeAbility for children and adults alike. Come and have a go and test your bike skills. 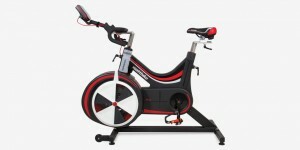 It’s fun and gives you the skills and confidence to cycle in modern road conditions. H-Bug (Honeybourne Bicycle Users Group) are organising a short family ride around some of the lesser travelled routes around Broadway for all ages and abilities. The scenic bike ride will be 1.8 miles, starting on the green opposite The Swan, go down to the B4632 turn; turn left along West End; turn left onto Snowshill Road and back to the green. We will ride as a “bus” so that we control the traffic. 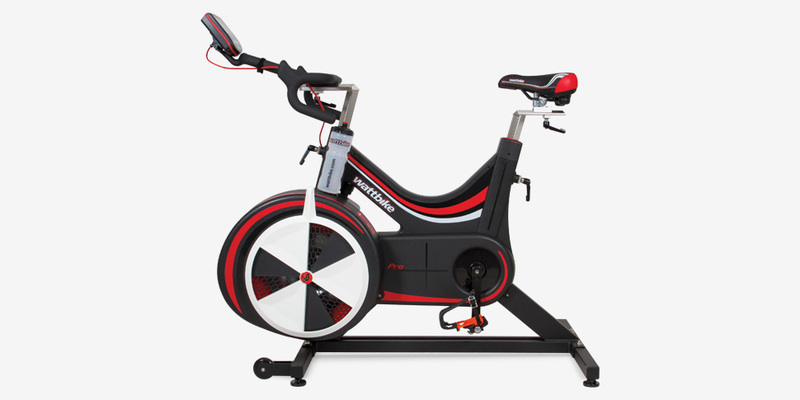 Come and test your power output on Triathlon coach, Richard Goode’s Wattbike, and have a chat about his swimming and triathlon coaching. Ever wondered what it’s like to ride a tandem? Come and have a go, on a static tandem. Courtesy of H-Bug (Honeybourne Bicycle Users Group). Thanks to Wychavon Council for their support, as they are organising and manning the road closure. They really have been very helpful. Thanks to Nigel from Vale Press for printing help.